The SZ77R5 is a mainstream system for gaming, entertainment and multimedia purpose. It features Intel® Z77 Express chipset and supports the Intel® 22nm Ivy Bridge Processor. Compared to its predecessor Sandy Bridge, the new design brings some improvements in overall performance, overclocking, power management and also features PCIe v3.0 and DDR3-1600 capability, an updated DirectX 11 graphics, new security features and CPU instructions. In addition, the SZ77R5 supports four native USB 3.0 ports that come with better power saving. Compared to its predecessor Sandy Bridge, the new design benefits Shuttle SZ77R5 which brings some improvements in overall performance, overclocking, power management and also features PCIe v3.0 and DDR3-1600 capability, an updated DirectX 11 graphics, new security features and CPU instructions. The Z77 chipset consists of a single chip and integrates the hard drive controller, network controllers, monitor and physical interfaces, PCIe links and other input/output functionalities. It combines the advantages of the predecessor Z68 plus native support for four USB 3.0 ports. 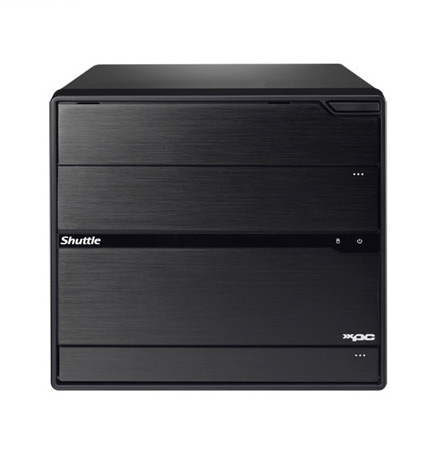 Shuttle has always placed great emphasis on the interior and exterior aesthetics of the XPC, with the belief that a good blend of style and form factor allows the XPC to be attractive, versatile, and work well in almost any environment. R5 is the new chassis design for the middle to high-end series XPCs in the year 2012. The chassis and case cover are made of aluminum and come with a sleek brushed metal front fascia. The SZ77R5 supports the new PCI-Express x16 Version 3.0 specification in combination with the 22nm Intel Ivy Bridge processor slot delivering a bandwidth of up to 16GB/s which is twice the speed of PCI-E 2.0. It offers backward compatibility with PCI-E 1.0 and PCI-E 2.0 devices. There is plenty of potential for PC users who aim to optimize the graphics performance. Intel® Rapid Storage Technology offers new levels of protection, performance, and expandability for desktop platforms. By seamlessly storing copies of data on one or more additional hard drives, any hard drive can fail without data loss or system downtime. When the failed drive is removed and a replacement hard drive is installed, data fault tolerance is easily restored. 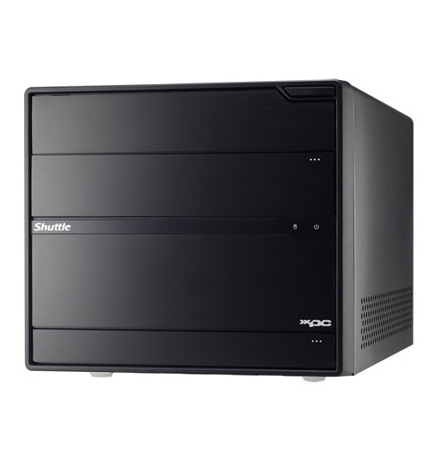 The SZ77R5 has the capacity for four 2.5” HDDs by replacing with Shuttle PHD3 3.5” to 2.5” HDD rack. 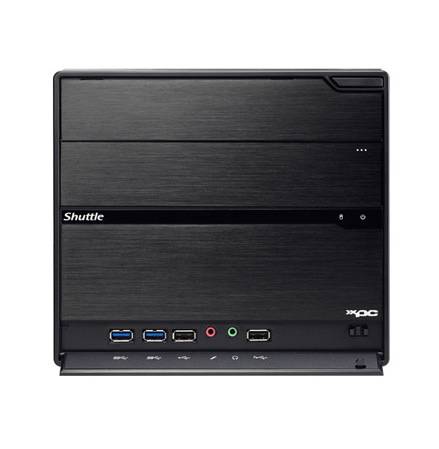 The Shuttle XPC Barebone SZ77R5 supports the much anticipated Intel Smart Response Technology which allows a SATA solid-state drive (SSD up to 60GB) to function as cache for a conventional hard disk drive (HDD). It uses intelligent block-based caching of frequently used applications to improve system performance and responsiveness. The SZ77R5 sports four USB 3.0 ports (2x front, 2x rear) and USB 2.0 x6 ports. USB 3.0 achieves a maximum data rate of up to 5.0Gbps (640MBytes/sec) USB 3.0 also comes with better power saving features to let your devices consume less power when in idle mode. With the space-efficient design, the SZ77R5 is as roomy as it gets. Not only it’s space-saving but also it maximizes the need for high-end users and markets. The designs for dual-slot graphic cards provide the users a faster and smarter performance. * Supports high-end graphics card AMD Radeon™ HD 7970 and NVIDIA® GeForce® GTX 680. Shuttle SZ77R5 features two Mini-Card expansion slots. One is a half size Mini-PCI-Express slot dedicated for Wireless LAN adapter cards. The second features a combo port with Mini-PCI-Express &mSATA interface (Mini Serial ATA) which supporting the new generation of Solid State Drives (SSD) in a compact Mini PCIe card form factor. The Shuttle Smart USB Port is a USB port which allows fast power charging when a smart phone or tablet PC plugin is detected. It is designed to feed power up to 5V/2A(varies with different smart devices) no matter when the system power is on or off. * 2A only available for Windows XP and Windows 7 O.S. The normal charge 500mA applies to other mobile devices and Linux O.S. Dual View technology offers multiple display support on up to two separate monitors. This help to improve on productivity by allowing to spread multiple windows across two monitors while working with them simultaneously. The SZ77R5 provides HDMI and DVI-I with full 1080p support to deliver the stunning full HD and 3D graphics for high-end users. With additional adapters, DVI-D devices can be connected to the HDMI port while D-SUB(VGA) can be connected to DVI-I. Allowing XPC to remain under a stable, cool, concise and silent condition, the Shuttle I.C.E. 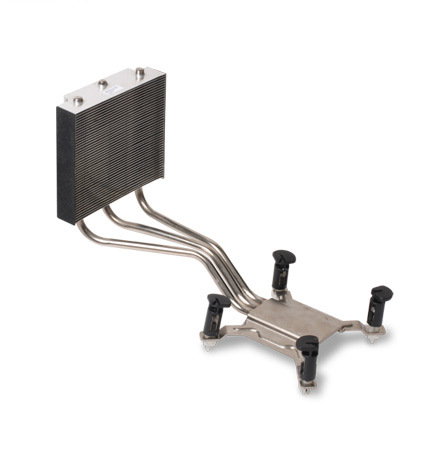 heat pipe Technology uses convection cooling to dissipate heat away from and around the CPU. With all the same basic concepts and designs, the I.C.E. copper tubes coated in nickel enhances tube hardness and rust-proof protection are filled with distilled water, effectively channels heat away, providing high efficiency processor and chassis cooling. 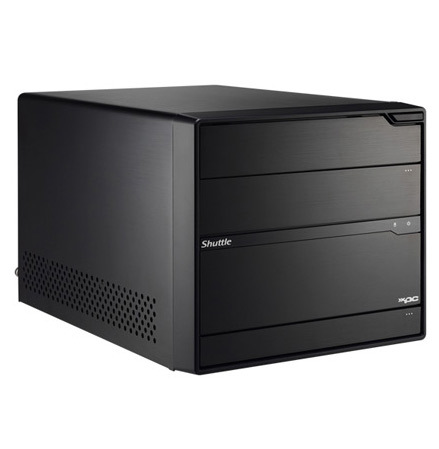 Shuttle expands the capabilities of its R chassis, adding support for Mini-ITX mainboards (17 x 17cm or 6.7 x 6.7 inches). 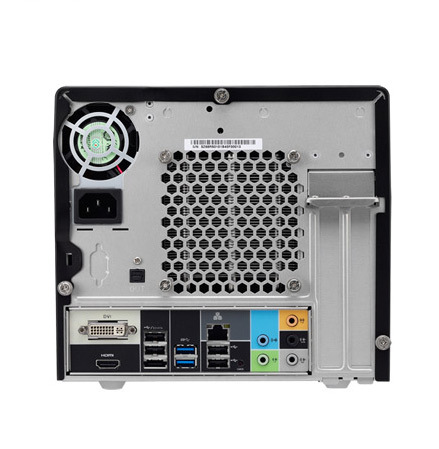 The Shuttle chassis can go beyond the Shuttle mainboard, so you can easily upgrade or downgrade the mainboard to your desire, without any modifications to the chassis. 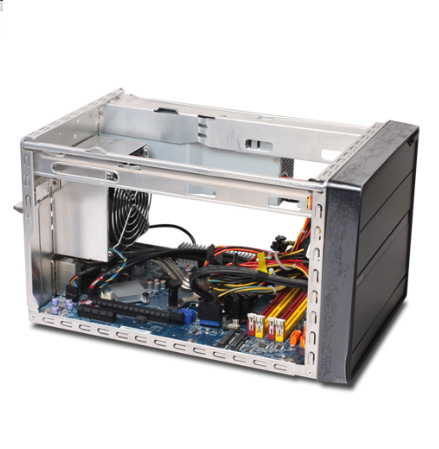 The 80 PLUS ® performance specification requires power supplies in computers and servers to be 80% or greater energy efficient. This makes an 80 PLUS certified power supply up to 33% more efficient than current power supplies. 500W high efficiency & energy saving power supply of SZ77R5 guaranteed by 80 PLUS BRONZE certification. In addition, the power supply uses a 50mm cooling fan providing the same airflow, but spins slower than previous 40mm models to make the system run even more quietly.